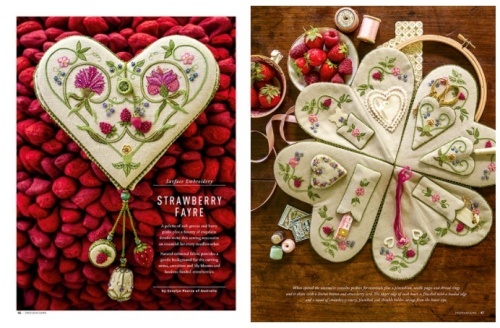 Carolyn Pearce Strawberry Fayre heart etui 7: Let’s get started!! I haven’t had a stitchalong on my blog before, so it’s going to be slightly different from the other projects that I have written about as I’ve been stitching them – with this one, hopefully there will be more interaction from all you lovely people, and I can respond to questions, etc., if you post comments each time. Occasionally, I’ll be asking you to send me images of your progress, so that we can all have a look! It’s supposed to be fun! This is not a test, so whatever skill level you are at, just relax into it, and have a go, and enjoy the process. I am not selling anything here! This is not my design – it’s by the very talented Australian designer, Carolyn Pearce. The design appeared in Inspirations magazine number 95, in Autumn 2017, and I am simply stitching that design and sharing how I do that, as I love it. I do not sell the magazines, the materials packs, the fabric, or anything else, so please don’t ask me 🙂 See the end of this post for where to buy the stuff. 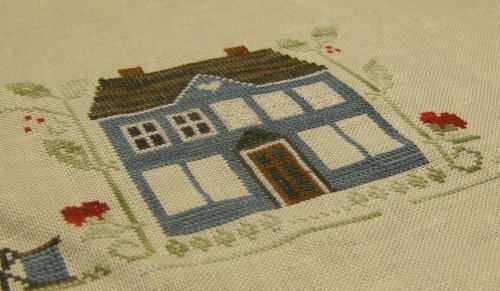 Although I will try to post regularly, this blog is more for me to write about stitching as my hobby rather than a business (although I do sell dollhouse needlepoint kits, if you’re interested in those), so if there is a break of a couple of weeks, or I post about something else sometimes, don’t be grumpy with me – we’ll get back on track soon, honest. I have no idea how long this project will take – but I estimate it will be several months. If you can’t keep up in ‘real time’, don’t worry – the posts will be here as an archive for you to come back to and work through at your own pace later. PLEASE, PLEASE, PLEASE, if you decide to participate in the stitchalong (even if you start later than January 2018), comment below and tell me your name and which country you are from, and a bit about yourself. 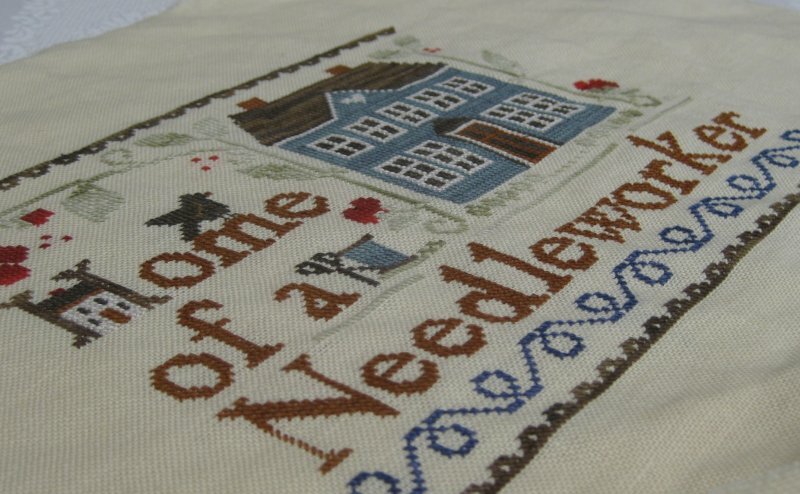 I would love to know how many people are stitching this, and where you are all from! I’ll be stitching the etui in the order that it’s set out in Inspirations magazine, as Carolyn’s instructions are so well-organised, it wouldn’t make sense to do it differently. I’ll try to list my variations / substitutions as I go. 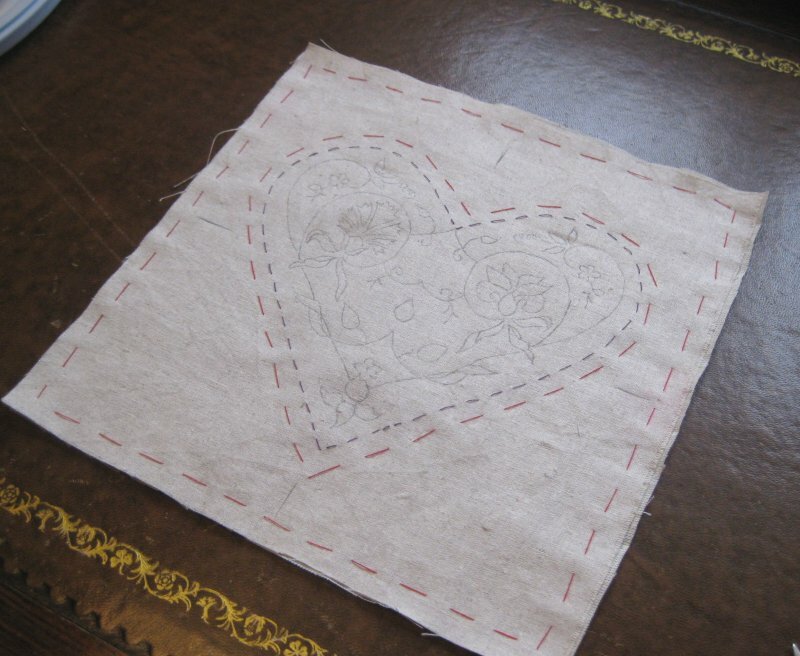 So, I’ll be stitching the front and back hearts, then the inside pockets and smalls, then what I call the ‘dangleys’ – the three 3D items that hang from the bottom of the heart – then the assembly. This project is not particularly difficult, but it is detailed, so make sure you read through all of the project information in the magazine, as well as on the pullout sheet, before you begin, so that you are familiar with what will be needed, and the order of stitching and assembly. I find that it’s easier to scan in the relevant project pages from the magazine and print them out in colour, then use them a page at a time as I’m stitching, rather than trying to manhandle the whole magazine all the time. The instructions say to cut out all the fabric pieces from the 20 x 55 inch piece of cotton/linen blend fabric before you begin. (My fabric was 20 x 45 instead, and yet I had just about enough.) 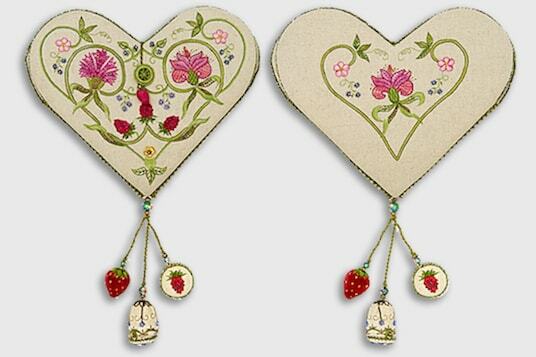 There are 8 heart-shaped pieces in total to make up the etui, and six of them have embroidery on. 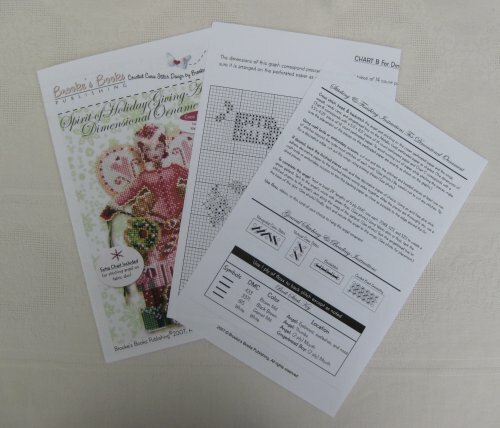 The pockets and ‘smalls’ are made from the same fabric as the outside of the etui, and the pull-out instruction sheet has a cutting layout guide for each type of fabric used in this project (including wadding, template plastic, etc.). 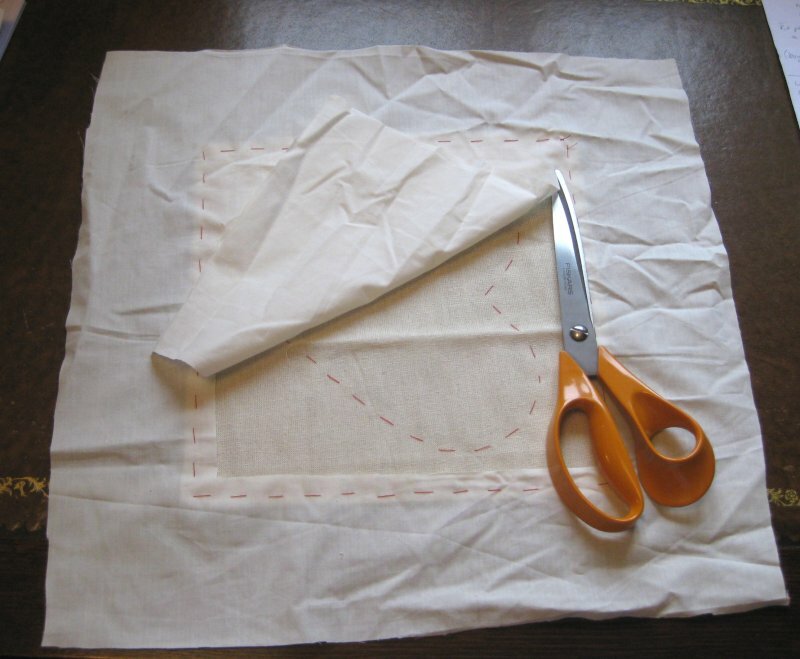 The only change I’ll be making to the cotton/linen blend fabric cutting layout is that they suggest stitching several of the smallest pieces on one piece of fabric measuring 10 x 14 inches. I don’t like doing it this way on such a large rectangular piece of fabric, as it means moving my hoop around on stitching I’ve already worked, which can crush stitches. So, instead, I cut templates for each of the pieces from interlining as Carolyn suggests, then laid them on a piece of fabric that would definitely fit in one hoop (my largest hoop is 12 inches diameter), making sure that I left enough of a seam allowance around each template. That meant that the ‘cutting layout’ ended up being a bit of a different shape to the one on the pullout sheet, but everything fitted, eventually. I then tacked around each template to transfer the shape outline, then removed the templates. 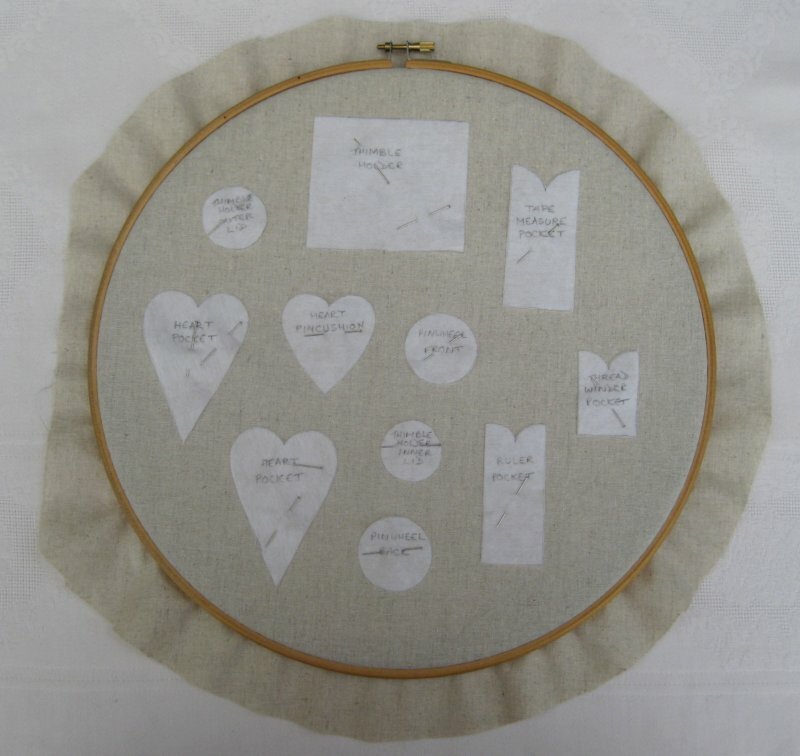 There are a few pieces that need to be cut from the embroidery fabric to make the linings and so on for the pockets – the patterns for these can be transferred using the same interlining template pieces, but using just scraps of fabric, as they are not embroidered later, so the fabric doesn’t need to be large enough to fit in a hoop. Just make sure that you leave about 5/8 inch seam allowance between pieces. 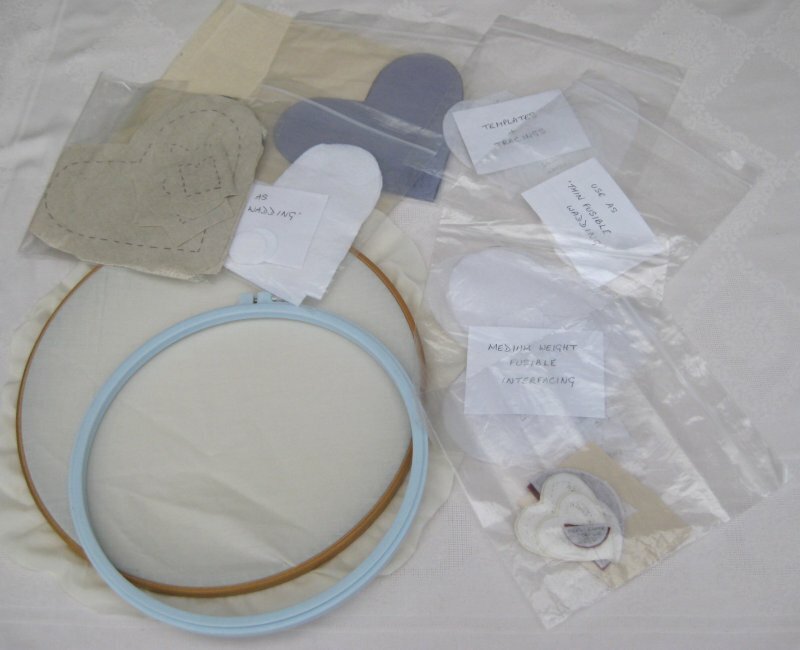 The instructions suggest using quilter’s muslin to back each of the cotton/linen blend pieces in the hoop that you will be embroidering later – polycotton sheeting is a good alternative, if you don’t have the muslin. I mount most of my fabrics in hoops, in what I call cotton fabric ‘windows’, to save wasting the cotton/linen blend fabric, and so that I can use large hoops to do the embroidery, as that is more comfortable for me. 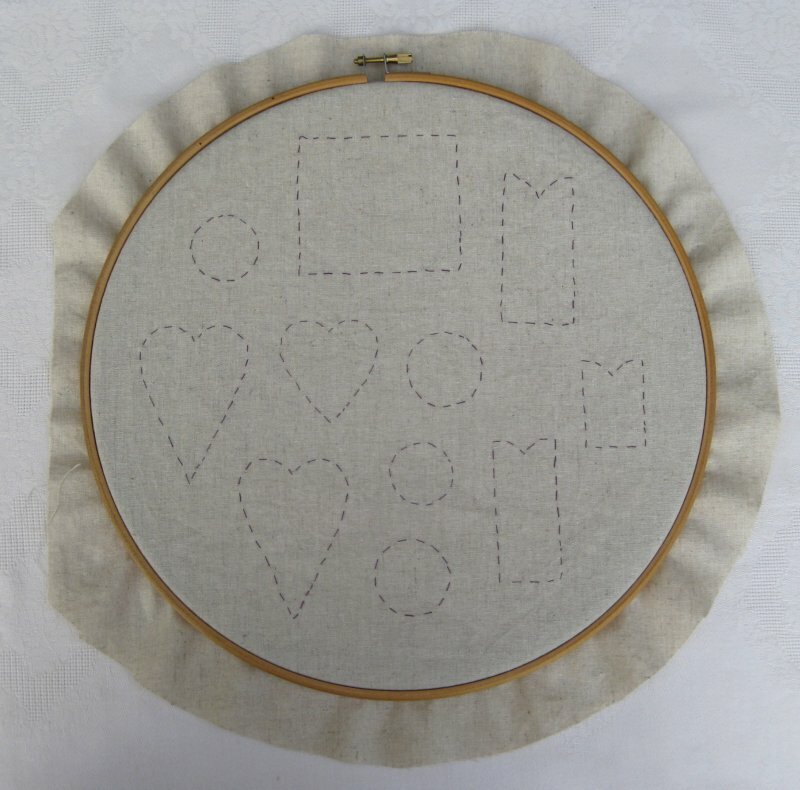 To do this, I cut a paper template first to the size of the fabric for what I’m going to stitch, then place it on my embroidery fabric and allow about an inch all round, then cut the fabric out in a square or rectangular shape. Then I take a large piece of cotton fabric (leftover from my dressmaking stash, or old sheeting – anything strong but non-stretchy will do. Men’s handkerchiefs are good! ), and centring the embroidery fabric on the cotton one, tack the embroidery fabric half an inch in from its edge, matching grain lines of both fabrics. Then I carefully cut away the cotton fabric from the centre (from the reverse side), leaving the embroidery fabric with a ‘window frame ‘ of cotton around it. This makes it much easier to mount in the hoop, and saves wasting a lot of the ‘posh’ fabric. The ‘windows’ can be used indefinitely – I have a huge stash of them of various sizes, from previous projects, with the dimensions marked in the top right-hand corners, to make finding one of the correct size quicker! For this project, I cut the window fabric 16 by 16 inches, as I’ll be using a 10 inch hoop. With this project, the fabric we’ll be embroidering is actually two layers each time, due to the backing of quilter’s muslin. To deal with two layers with this method, I simply tack the backing fabric to the embroidery fabric after having transferred the design, and before I fix it into its ‘window’, and proceed with the double layered fabrics being treated as one. It’s simpler to do than to explain, honest!! 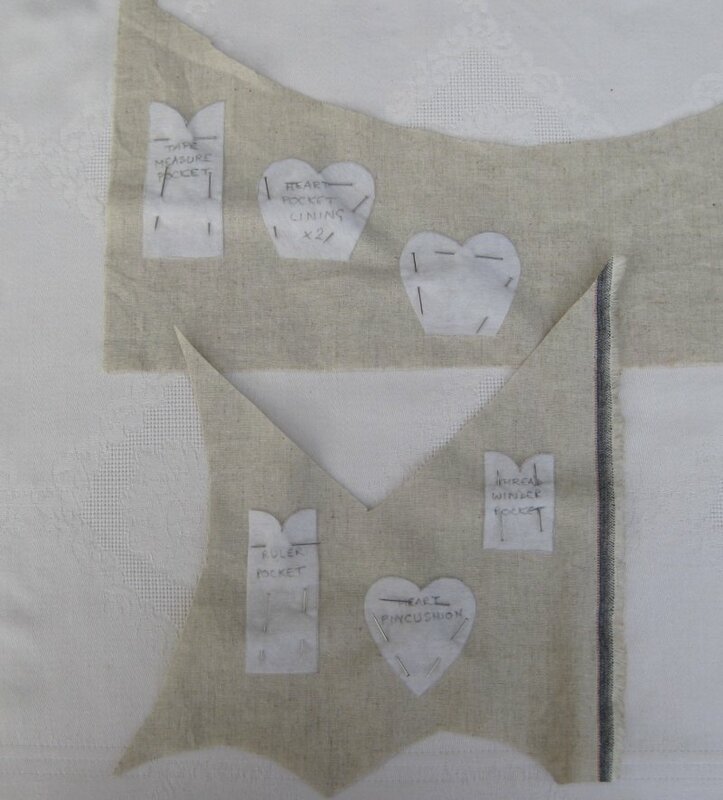 So, using one of the 10 x 10 inch fabric pieces, and before backing it with muslin or placing it in its ‘window’, I traced a heart shape from the pullout sheet onto medium interfacing, pinned it to the fabric, and tacked around the edge to transfer the shape without having to draw on the fabric. Six of the eight heart shaped pieces will be embroidered, so I made six of these. 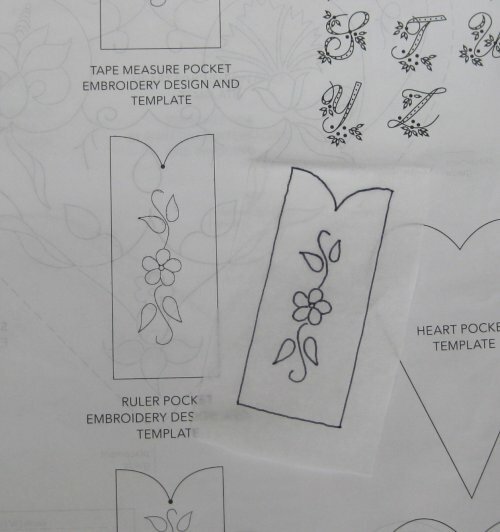 To transfer the details of the design of the heart and the smaller pieces, I used a light box, and first traced the design from the pullout sheet onto dressmaker’s tracing paper with a Staedtler Triplus Fineliner in black. Then I taped the tracing to the light box, placed the fabric on top and taped it in place with masking tape, and drew over the tracing lines with a sharp pencil (not a permanent brown pen, as they suggest in the magazine, as that’s far too scary!! As long as the fabric doesn’t get rubbed too much while you’re stitching, pencil will be fine). As you’re transferring the design, occasionally turn the light of the light box off, and check that you have transferred every line, and that your tracing lines are showing up properly. It’s easy to miss one, and better to correct it now, while the fabric is on the light box. 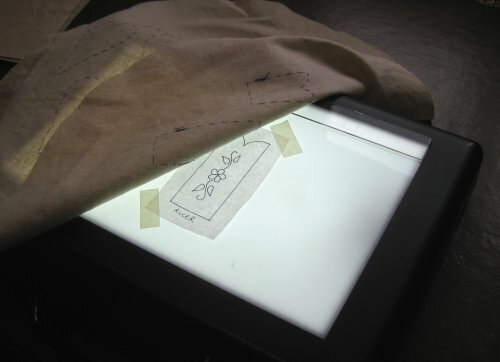 Place the pullout sheet with the tracing designs next to the light box as you trace, so that if you’re not sure where a line should go, you can check the original without lifting the fabric off the light box. Note: On the main front heart design, there is a stem line missing on the lower left hand side, but it’s easy to see where it should be, as it mirrors the one on the right! Once the design was transferred, I could then back it with the muslin, tacking around the previous line of tacking half an inch away to prevent the two fabrics slipping/bagging, and also around the very edges of the fabric ‘sandwich’. 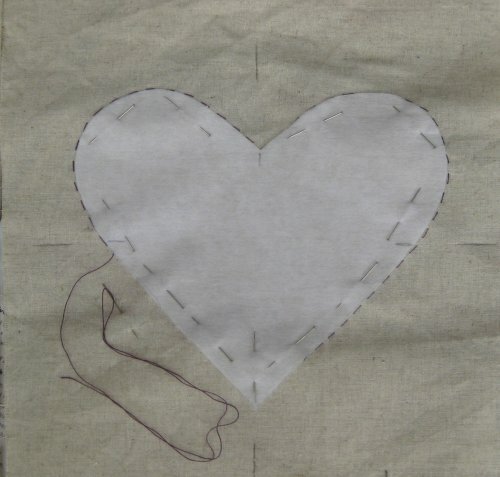 It’s helpful to use a different shade of sewing thread to do this, so that it’s clear which is the heart outline, and which is the tacking thread for the two fabrics, to prevent nasty cutting mistakes later on…. 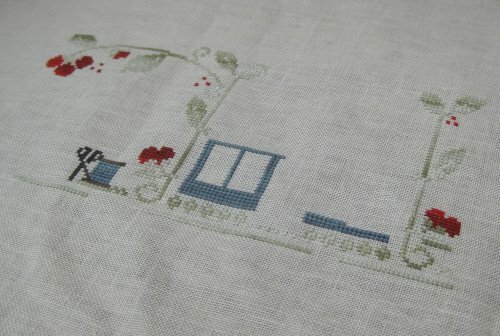 Then it could be mounted in its ‘window’, and the cotton backing carefully cut away from the reverse side. Then the whole lot could be mounted in a hoop. I’m using a ten inch hoop for the large hearts, and a twelve inch hoop for the fabric piece with all the smalls on. Although it can seem tedious, I find it is better to cut out all of the fabric, interlining, wadding and plastic stiffener pieces now, at the beginning, and store them in resealable plastic bags, with a note on to identify things. This took me all of one Saturday….! After all that, we should be ready to start stitching…. with these!!!!! Now, that’s much more interesting, isn’t it? 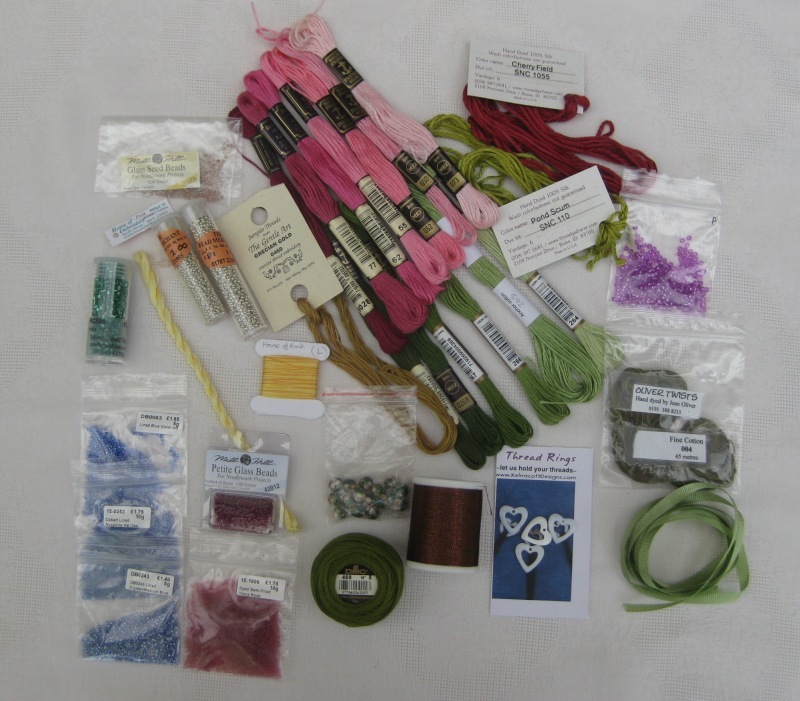 Lovely colourful threads, dinky little beads, grosgrain ribbon, metallics….. now we can actually get started!! Comment below if you’re going to be joining in with this….. Author Janet GrangerPosted on January 25, 2018 January 25, 2018 Categories 02. Preparing the fabricTags Carolyn Pearce, Embroidery, Etui, Heart etui, Inspirations magazine, Strawberry Fayre60 Comments on Carolyn Pearce Strawberry Fayre heart etui 7: Let’s get started!! Dollhouse inspiration – stitching in miniature to see! 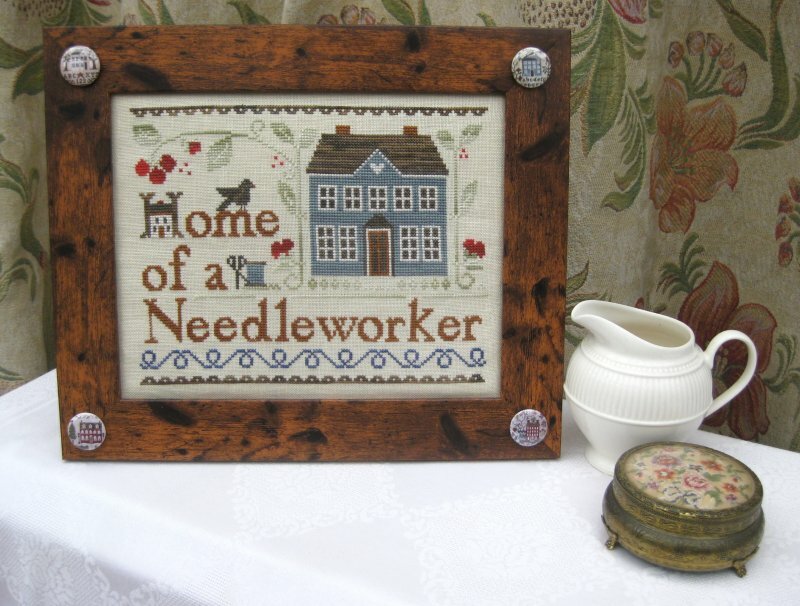 I often get customers of mine emailing me with photos of the stitching that they have made from my miniature needlepoint kits for 1:12 scale dollhouses and room settings. I love to see what people do with the kits that they buy from me! Before Christmas, I had several people send me pictures, and I didn’t get time to feature them here, so this blog post is a bit of a round-up of wonderful dollhouse inspiration – both the stitching, and the incredibly creative ways that they have decorated their dollhouses. Have a look at these! 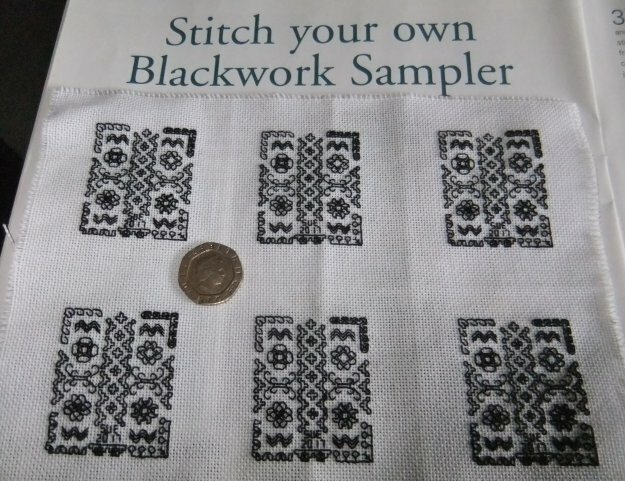 Susan E. sent me this image of six copies of the blackwork sampler design which was featured in Dolls House and Miniature Scene magazine as a project (that’s my article that you can see underneath her fabric! ), back in the autumn of 2017. She was making multiples of the design in order to give them as gifts in a ‘swop’ that her craft club were going to have just before Christmas. 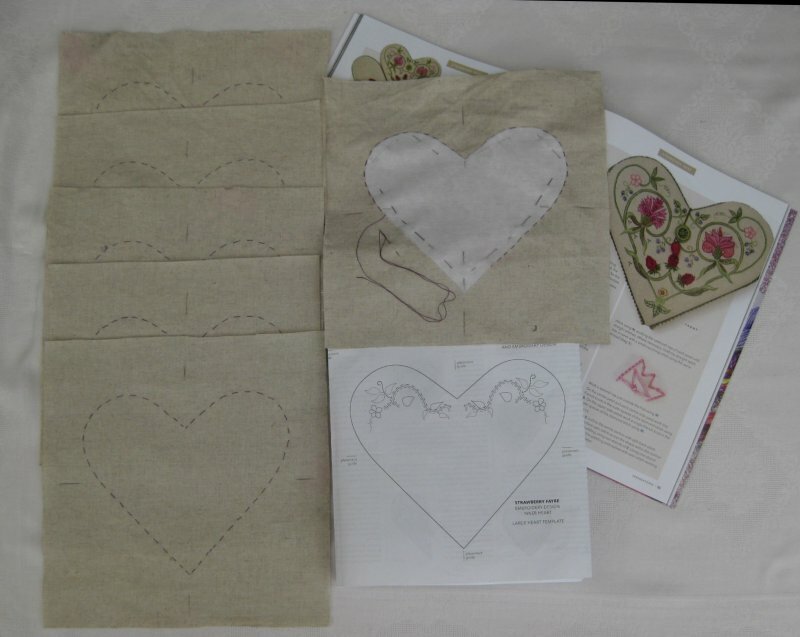 The design itself is also available as a kit, to be stitched on 28 count evenweave fabric, with one strand of Anchor thread. I think she has a lot of patience to do so many multiples of the same design! She then sent me another image nearer to Christmas, after she had framed ALL TEN of the samplers she had stitched by then! They look amazing once they’ve been framed, don’t they? I particularly like the ones with the gold frames. 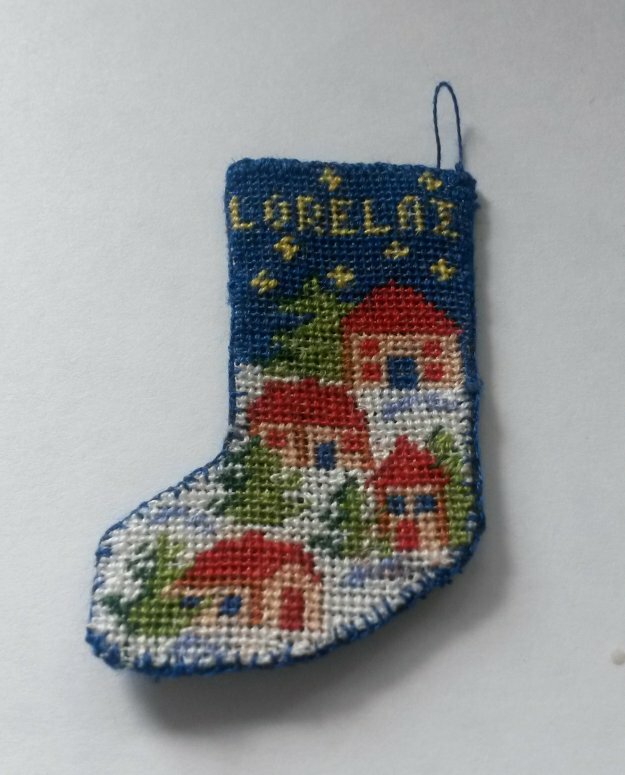 Annette J. has been a customer of mine for years, and has stitched lots of my dollhouse needlepoint designs, but even I was surprised by this picture that she sent me – I hadn’t realised how many of my Christmas stocking designs she had previously bought! These are all stitched on 40 count silk gauze. Don’t they look great together? Another customer, Zanna B., sent me this image of a stocking as well, but this one has been personalised by her – it’s the Snowy Village dollhouse stocking design, which she has added lettering to, across the top – not easy to do, at this scale, and still have it readable (as the stocking is only 1.25 inches high when finished), but Zanna has managed it! She used the alphabet provided in one of my sampler kits (very resourceful!) to add the name of her grand-daughter to the stocking. Sylvia B. adapted the Two Owls firescreen design to suit her dollhouse, which she is decorating to resemble her full sized cottage. 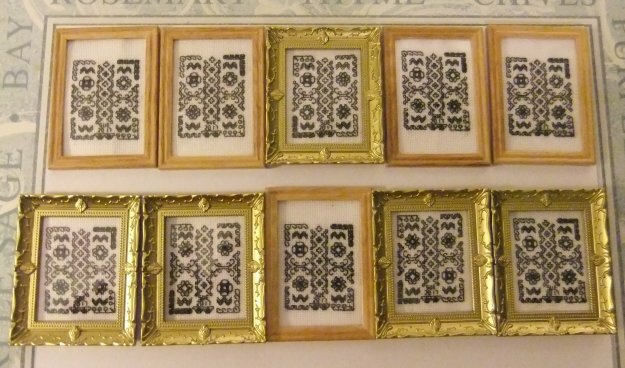 She framed her firescreen with a wooden frame (whereas the kit that I sell usually has a metal frame) so that it would be authentic for her dollhouse. The firescreen design is stitched on 32 count silk gauze. 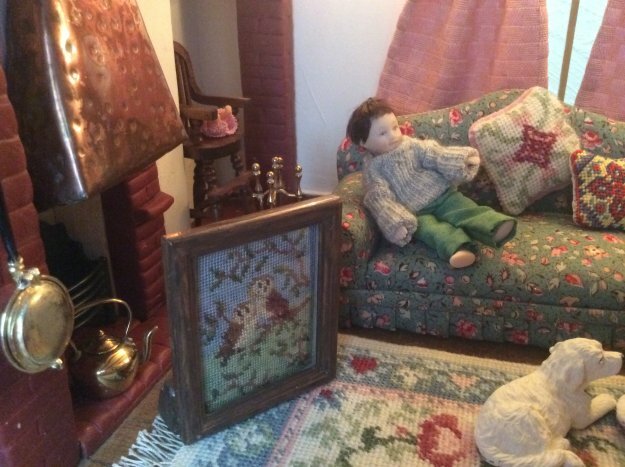 The little firescreen is standing on a Carole pastel carpet, and there are two cushions on the sofa which she has also stitched. It’s a very cosy room! 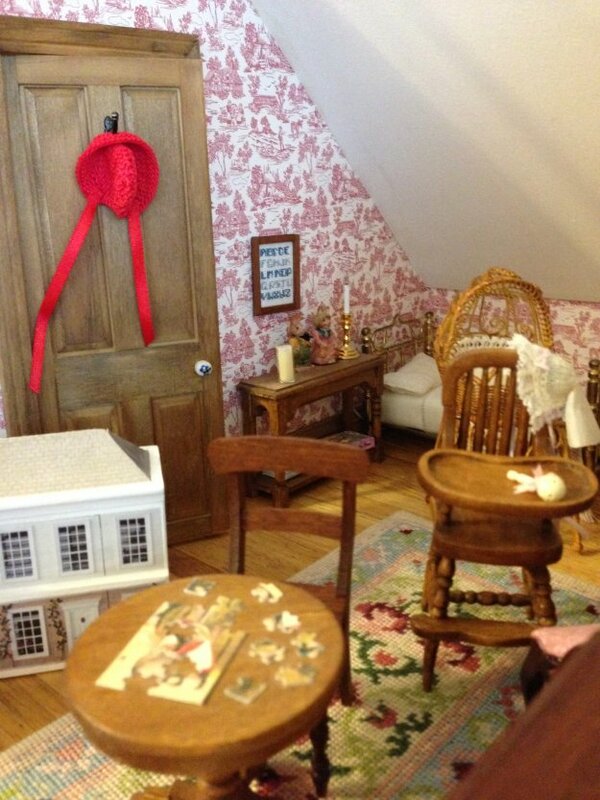 Finally, Kath C. sent me these images of her dollhouse. 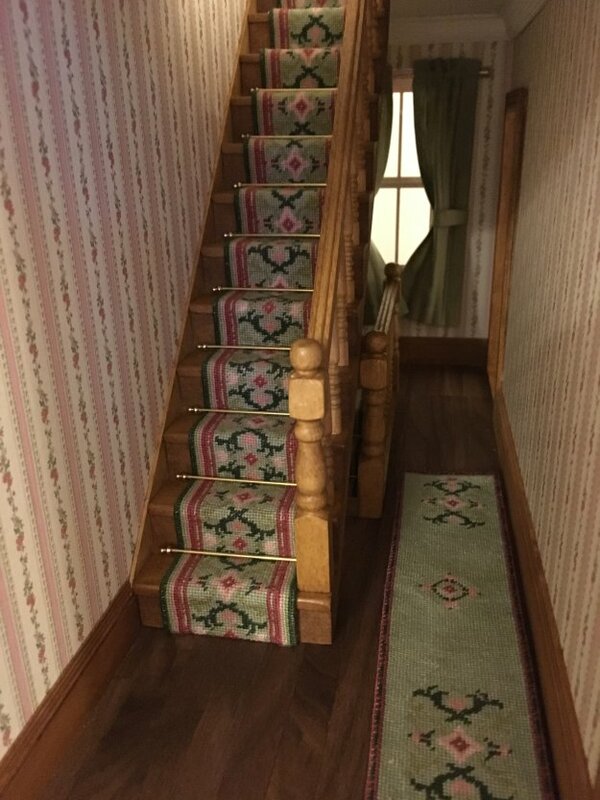 She first stitched a staircarpet (the Carole jade design), and then made a hall runner to match, using parts of that design in her own way, to make a really beautiful long thin carpet. In her dollhouse nursery, she has a Carole pastel carpet. I love the jigsaw on the table in the foreground! 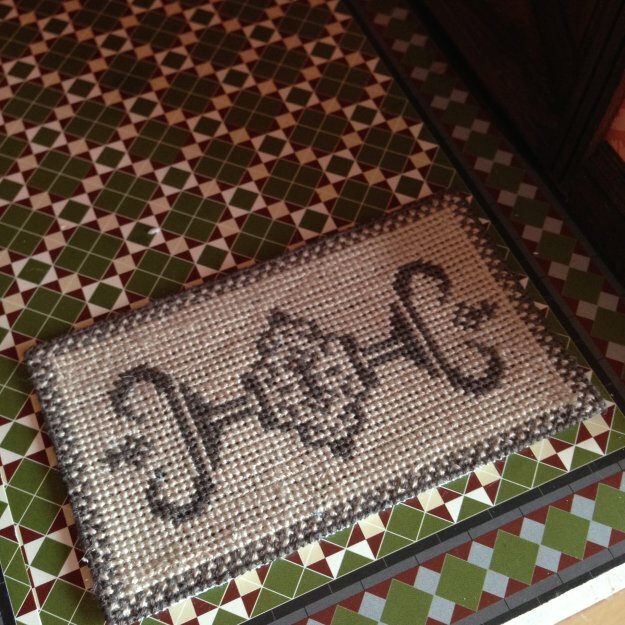 In the entrance hallway, she has also stitched the Alison (charcoal colourway) carpet, which looks really good on the tiled floor. I also have a section on my website for inspirational pictures sent in by my customers, so take a look at that for lots more lovely mini rooms! 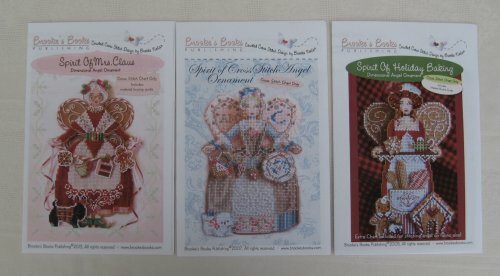 If you’re tempted to buy a kit or chart of a dollhouse needlepoint design, my January Sale is on at the moment, so you could save money whilst treating yourself to some stitching goodies! Author Janet GrangerPosted on January 11, 2018 January 9, 2018 Categories Customers' stitchingTags Crafts, Doll's house embroidery, Doll's house furniture, Dollhouse, Embroidery, Needlepoint, Samplers2 Comments on Dollhouse inspiration – stitching in miniature to see! What I got for Christmas 2017….. stitching goodies again! I always ask ‘Santa’ for something stitching-related for Christmas, and this year was no exception. We have a very good system in our house, where ‘Christmas elves’ very helpfully email the present-buyer well in advance of Christmas, with a nice list of possibles that the recipient might like! That way, everyone’s happy on Christmas Day! 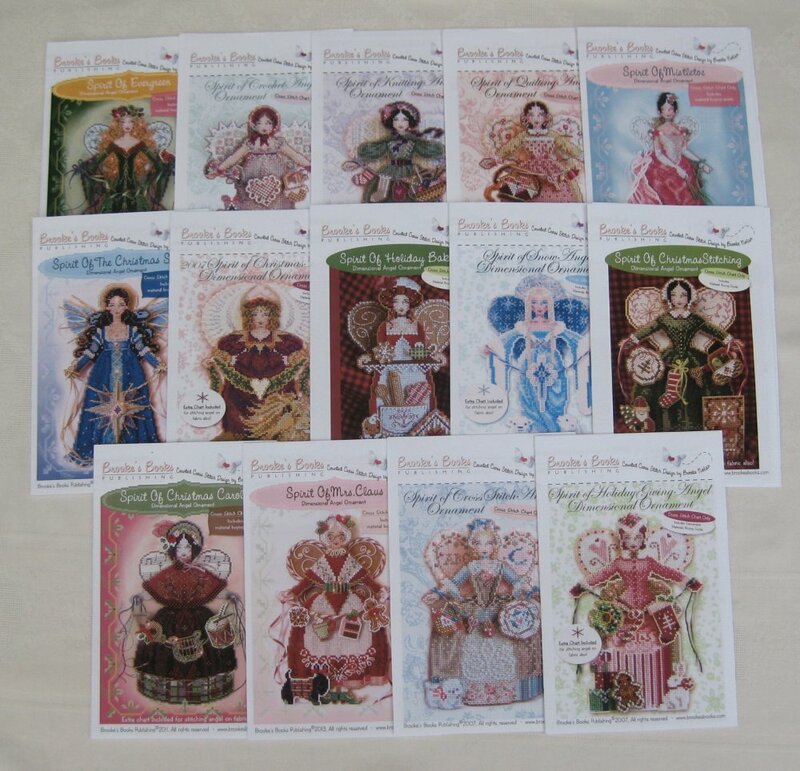 So, what I got this year was a fabulous set of 14 cross stitch charts to make stand-up Spirit Angels, designed by Brooke Nolan of Brooke’s Books Publishing. Her designs are gorgeous, and I’ve had my eye on them for ages. These are free-standing figures, about seven inches high, to be stitched on perforated paper in various colours, and then ‘accessories’ which have also been stitched on paper are attached afterwards, to make really interesting projects. I found Brooke’s designs on Etsy. She has a huge range of all kinds of designs – well worth a look. Some are hard copy charts, and some are digital downloads. Originally, I’d thought to have just a few of the Spirit Angels, but Brooke is currently running a bulk discount offer, where you can get all 14 designs in the series at nearly two thirds off! Who could resist that, even for a Christmas present?! This is what you get in each chart pack – a large colour photo of the finished design, detailed instructions, and the chart to stitch from (including a version for if you wanted to just stitch it on normal fabric such as 14 count Aida, and not make one on perforated paper with the accessories added on afterwards as separate pieces). 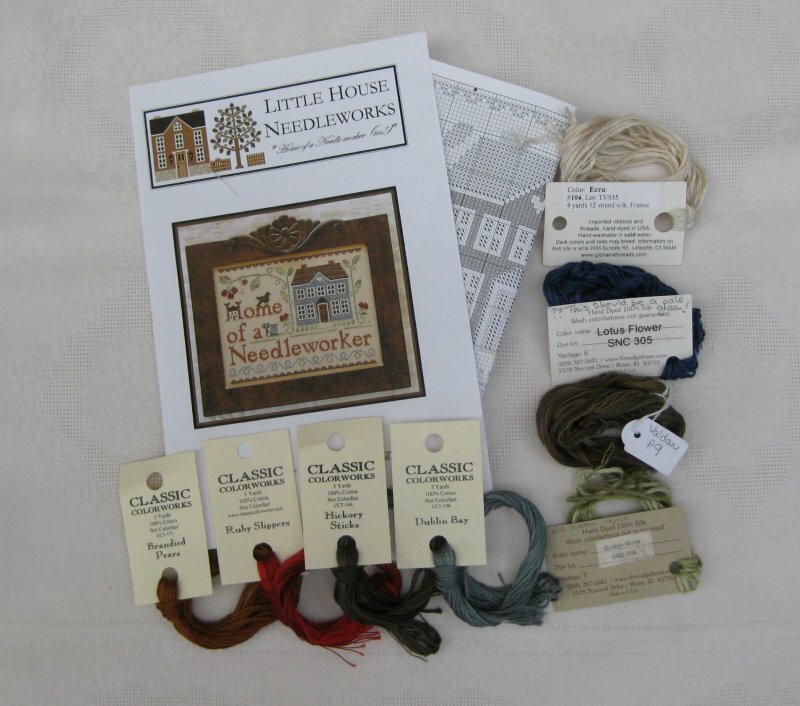 Materials needed are listed – you’d need DMC stranded threads, and 14 count perforated paper, plus some seed beads and sometimes fine Kreinik braids or DMC Memory Thread. The materials are interesting, but not expensive, which I liked. 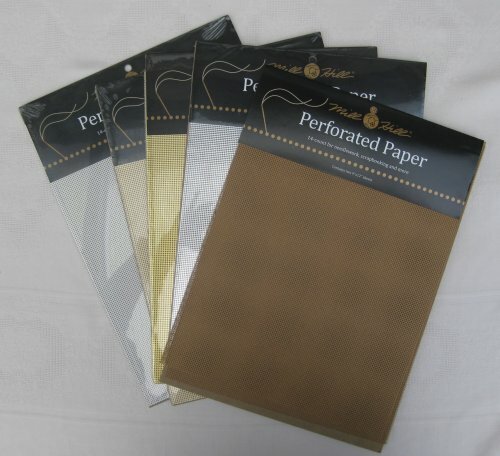 I also got some of the perforated paper packs. These are made by Mill Hill. Brown is used the most (for the bodies of the angels), plus gold, silver, white and cream for the accessories and wings. In the UK, Sew and So is the best place to buy this. Each pack contains two pieces of A4 sized sheets. Half a sheet is enough for the main body of each Spirit Angel, plus usually another half sheet of various colours in total for the accessories. 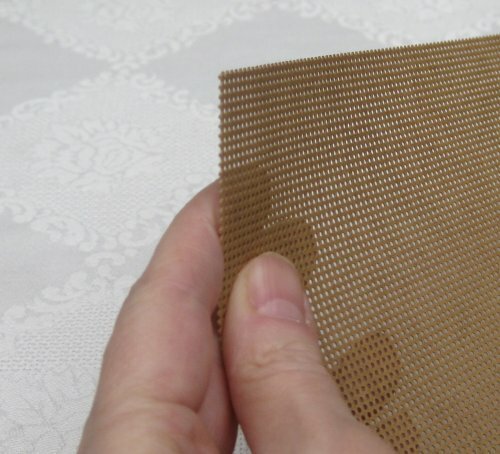 Although it’s called ‘paper’, it is quite thick – almost like a thin cardboard. And the holes are quite large and robust-looking, so as long as you don’t pull a thread through really hard and split the paper, it should be quite easy to stitch on (never stitched on perforated paper before though!). I’m just finishing off another quick cross stitch project (more on that next week), but hopefully it won’t be too long before I can get stuck into making one of these beauties! Author Janet GrangerPosted on January 4, 2018 January 8, 2018 Categories Brooke's Books Spirit AngelsTags angels, Brooke's Books Spirit Angels, Cross stitch, cross stitch on paper, fairies, Perforated Paper11 Comments on What I got for Christmas 2017….. stitching goodies again!